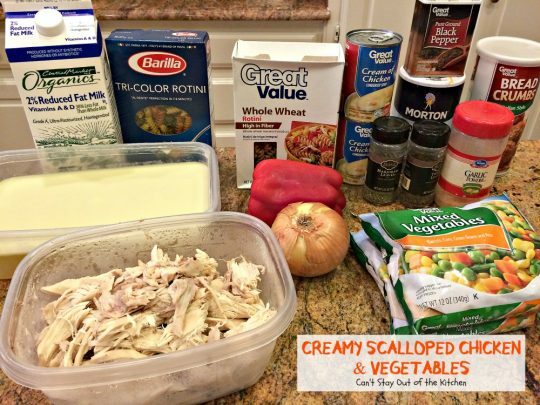 Creamy Scalloped Chicken and Vegetables is a heart-warming casserole is an excellent choice for cold winter nights. 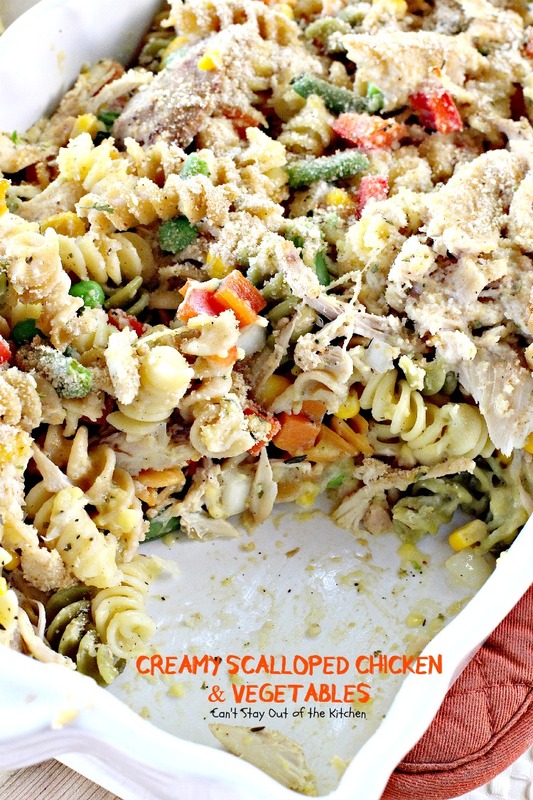 It’s filled with chicken, noodles, and veggies in a tasty creamy sauce and topped with bread crumbs making it very hardy, filling, nourishing, and a family favorite. I made this casserole a week ago for a funeral where I was trying to provide food for 20 people. I’ll share my original recipe and the one with all my additions here so you can have both in case you don’t need to feed 20 people at the moment! The nice thing about the big batch is you can make it and break it down into two or three casseroles and freeze one or two of them for later (depending on how full you want each dish). You can easily change out the ingredients in this recipe by using whatever noodles you have on hand and different assortments of mixed vegetables as you desire. This is also a great recipe where you can clean out your leftovers or use up garden produce in amounts you need to get rid of. 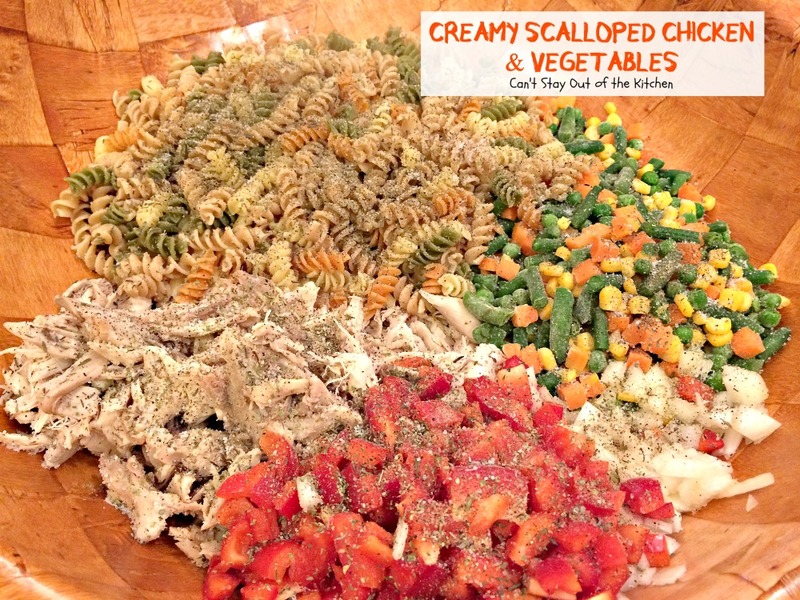 This Creamy Scalloped Chicken and Vegetables recipe was given to me years ago by a very good friend and mentor, Bonnie Rodriguez. Bonnie gave me so many recipes when I was first starting out as new wife–all of which I’ve made a lot over the years. She was never afraid to try new recipes and she gave me the courage to try things I’d never eaten before. I loved everything she made and was so grateful that she had us over for dinner frequently those first few years of marriage, when I didn’t know how to cook a lick. Bonnie never hoarded recipes either. She shared them very freely with me and others who were just learning how to cook in those days. I am deeply obliged to her! If you’re looking for great comfort food and a way to stretch your dollars, this economical, tasty, and substantial main dish casserole may be the ticket. It can also be used with leftover rotisserie chicken, spiral cut ham, or pot roast. As I said earlier, it’s a great way to use up leftovers. 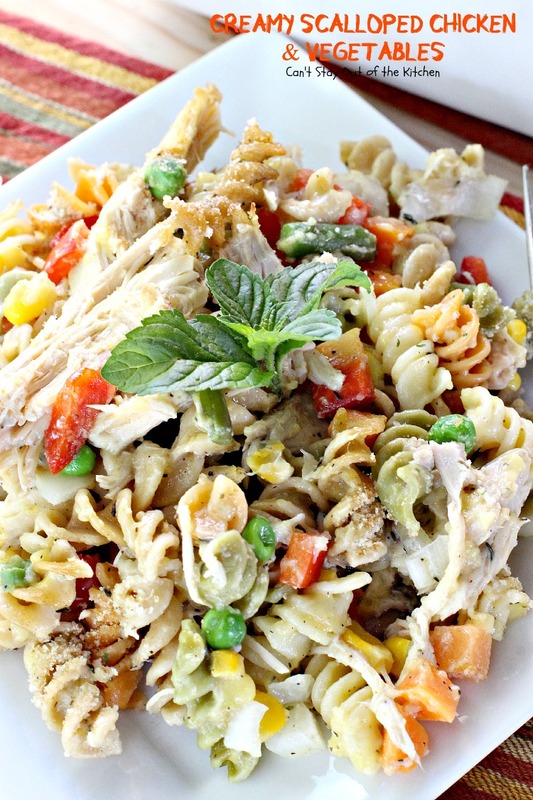 We love this great family recipe and think you will too once you make it. 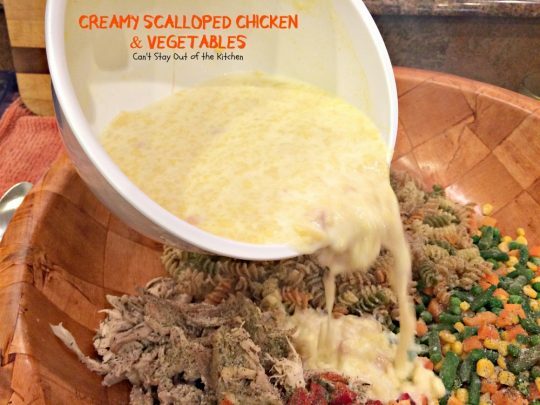 When I initially made this recipe in February 2013 it was for the family of Don and Judy Littlefield whose son, Chad, had recently died in a tragic accident along with his good friend, Chris Kyle. I didn’t know the Littlefield’s at the time I made food for their son’s funeral. We had been at the church about a year and the call came out that they were in need of food so I volunteered to make a bunch of stuff. It was only later that we met Don and Judy. They are a delightfully precious couple. In spite of the sorrow from losing their son so tragically, they still minister to everyone they meet. I recently remade Creamy Scalloped Chicken and Vegetables (April 2015) for two other families in our church. Since this recipe makes so much I gave one of the casseroles to a new mom who was also studying for her last nursing exam just a week after giving birth! The other dish I had planned on serving for us, but then a guy in our Sunday school class lost his father unexpectantly. When I offered to bring them a meal he asked if we would eat with them. I actually made another main course, salad, side dish and dessert for that night, but stuffed this casserole into two 8×8″ square foil pans and told them to freeze one for later, and the other they could refrigerate and heat up when they were ready. I meant to tell Lucy to add a little chicken broth or water to the casserole before heating it up so it wouldn’t dry out, but forgot to tell her. She said they thought it was wonderful just the way it was! It really is creamy with all the cream of chicken soup added to the noodles, chicken and veggies. If you’re looking for a delightful casserole to serve company or because you want enough to freeze one for later, then consider giving Creamy Scalloped Chicken and Vegetables a try. You’ll be so glad you did! 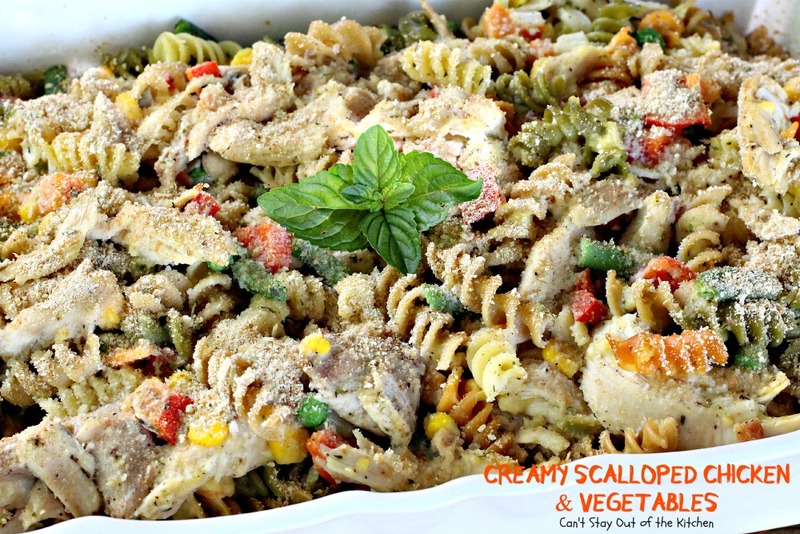 Creamy Scalloped Chicken and Vegetables is a fabulous pasta dish that’s comfort food at its best! This is a wonderful one-dish meal. 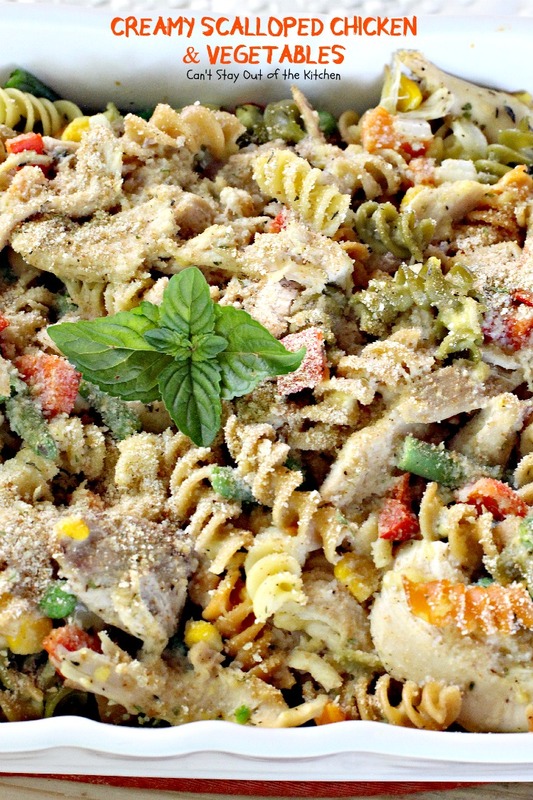 Meat, veggies, and noodles in a creamy sauce with a bread crumb topping. Yummy! 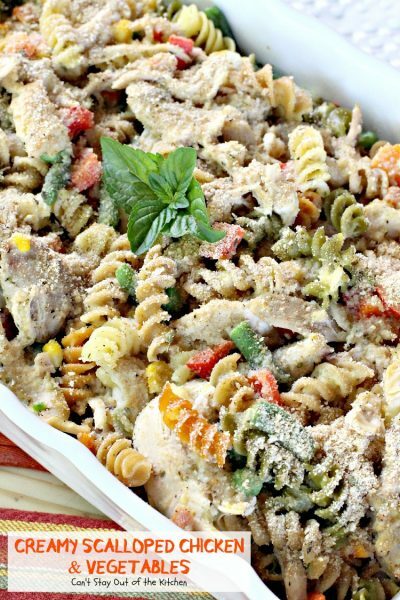 Creamy Scalloped Chicken and Vegetables is also an easy casserole to use up leftovers, extra garden produce, or any kind of noodle or pasta. You could even use this recipe with leftover steak or beef, pork/ham, or turkey. I used these ingredients. I had not skimmed the fat off the chicken broth when this picture was taken. I cooked a chicken in the crockpot on low overnight so it was ready the next morning when I was ready to make it. Debone the chicken and set meat aside. Reserve chicken broth. 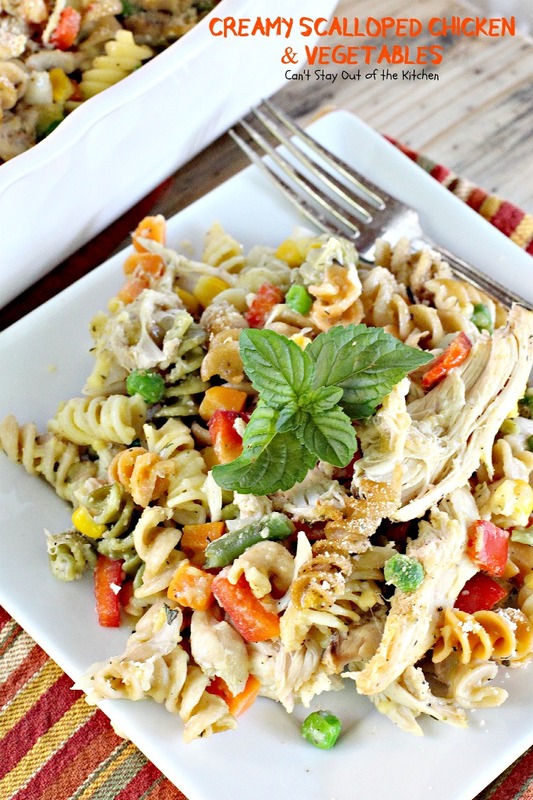 Save the chicken broth and cook the pasta in it. For 20 servings I used a whole box of garden rotini and about half a box of whole wheat rotini. One whole chicken yields about 4 cups of meat. Place meat in a large mixing bowl. Cook pasta according to directions. Drain. Save broth for another use if desired. Place pasta in large mixing bowl with chicken pieces. Add diced onion, diced red bell pepper, mixed vegetables and seasonings. Increase the amounts if you prefer more, or better yet – use fresh herbs! Place cream of chicken soup in a bowl. Add milk and whisk until smooth. Pour soup mixture into bowl with chicken, noodles, and veggies. Stir all the ingredients together. Spray two 9×13″ baking dishes with cooking spray. Divide the ingredients among the 2 baking dishes. Sprinkle bread crumbs lightly over top. Bake at 350 until warm and bubbly. A normal size casserole will be about 45 minutes to an hour. This is a wonderful casserole for company, too. I love the fact that you can improvise so easily with this recipe. 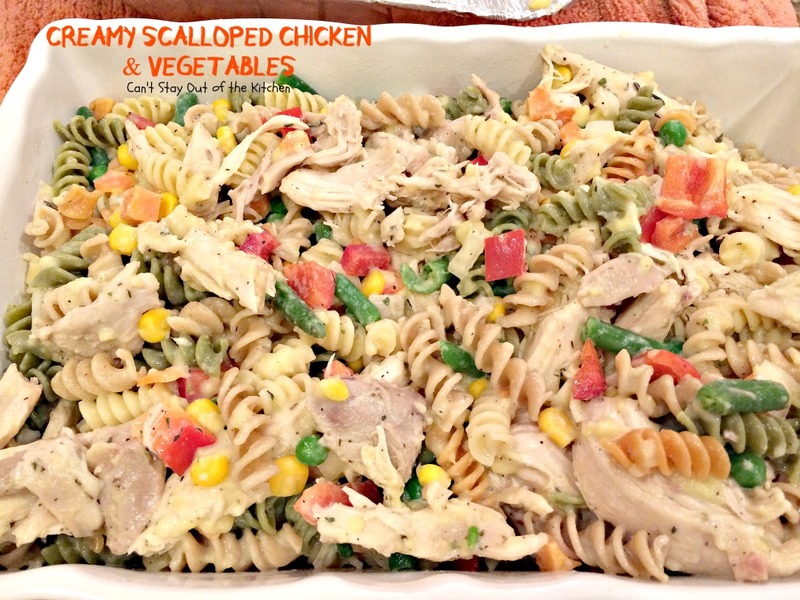 Creamy Scalloped Chicken and Vegetables is a nice and creamy main dish but also very satisfying and filling. You can make up the large version of this and freeze some for later, or just halve the recipe instead. Delicious casserole with chicken, pasta and mixed vegetables in a tasty sauce. 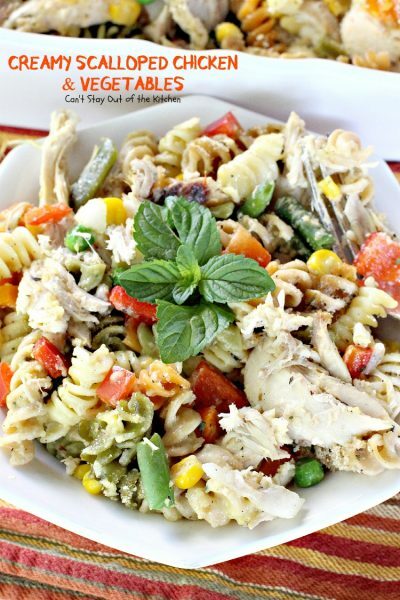 Place chicken, cooked, drained pasta, onion, pepper, mixed veggies, marjoram, thyme, garlic powder, salt and pepper in a mixing bowl and combine. 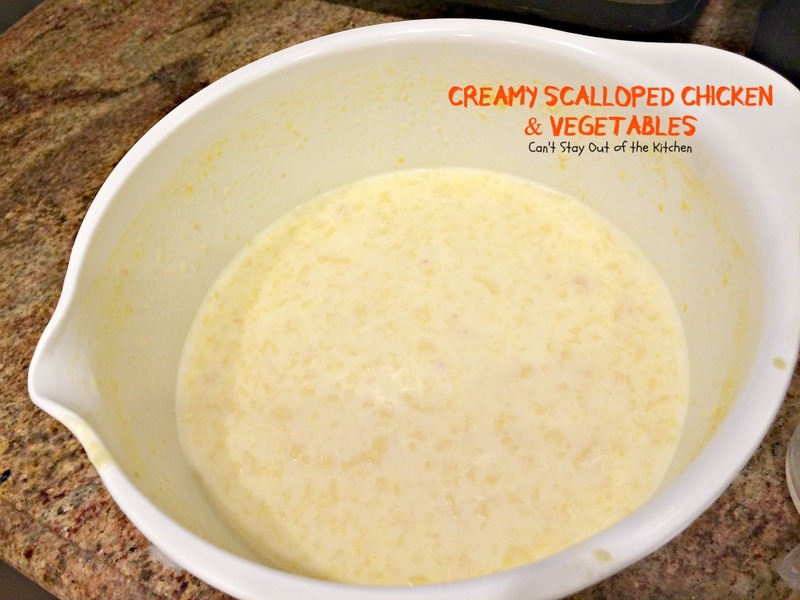 Combine chicken soup and milk in another bowl. Whisk together and stir into meat and veggie mixture. Spray 2 9x13” baking dishes with cooking spray. Divide the chicken and vegetable mixture between the two pans. Sprinkle bread crumbs over top of each dish. Wrap one of the casseroles with freezer wrap or foil and freeze until ready to use. Cover remaining casserole dish with foil and bake about 45 minutes to an hour at 350° or until bubbly. Remove foil to brown crumbs for maybe 5-10 minutes, if necessary. NOTE: This recipe makes enough for 2 9x13” casserole dishes. Make one now and freeze one for later. Or, cut recipe down in half or thirds, as desired. NOTE: For a little creamier dish, add between 1 and 1 ½ cups reserved chicken broth from cooking the chicken or pasta. Spray 2 9×13” baking dishes with cooking spray. Divide the chicken and vegetable mixture between the two pans. This recipe makes enough for 2 9×13” casserole dishes. Make one now and freeze one for later. Or, cut recipe down in half or thirds, as desired. [br][br]For a little creamier dish, add between 1 and 1 ½ cups reserved chicken broth from cooking the chicken or pasta. Doesn’t Creamy Scalloped Chicken and Vegetables look wonderful? Are you ready for a taste? This is great comfort food on cold winter nights. The great thing about this recipe is you can freeze some and pull it out when you don’t have time to do a lot of food prep. So delicious. You and your family will love this recipe.